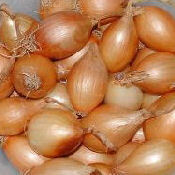 Onions need a sunny, sheltered site and for the best results prepare the soil well in advance. If this is not possible on your allotment as you have just got it try to choose an area is that is reasonable soil and have a go – remembering next year to prepare the soil in advance – another good reason for planning! It is too late to add manure to the soil at this stage as it will cause the onions to rot off in the ground. The easiest way is buy onion sets, these are immature onions. Rake over the tops few centimetres of soil and add a general fertilizer, for example pelleted chicken manure or fish blood and bone. Mark out rows, using a hoe or a cane, 25-30cms apart and using a trowel. Pinch off the whispy bits at the top so the birds don’t eat them. Plant the sets 10-15 cm (4-6” ) apart. The further they are apart the bigger the onions will be. The sets grow mostly in the coolest part of the year, they send their roots down into the soil so they can get to the water an nutrients. During the summer months the roots contract and all the goodness from the top foliage goes into the bulbs, this makes them swell and pushes them out from the centre, helping them to ripen. If the birds or frosts push them out of ground cover them with fleece until they get going. Plant maincrop, (summer) onion sets in March and April and overwintering onion sets (it is good to have winter crops and reasons to visit the allotment during winter!) in September and October. Keep them well watered in dry spells and remember they need regular weeding. Maincrop onions should be ready in August or early September when the leaves start turning brown. Lift the bulbs then and leave them in the sun to finish drying – I use chicken wire stretched on a frame to lay them on, this allows good air circulation. You can store them by plaiting them together or set out in trays in a shed. Over wintering onions can be dug up when needed from around mid-May – July. Good varieties are ‘Sturon’ and ‘Red Barron’. Japanese onions, can be over-wintered to provide an earlier crop the following year. For Japanese or over wintering onions, the sets should be planted in the Autumn, with spacing as for standard onions. Suggested varieties of Japanese or over wintering onion sets: Senshyu. Slightly flattened, brown skinned bulbs, maturing in late June. Electric. A good flavoured red onion.